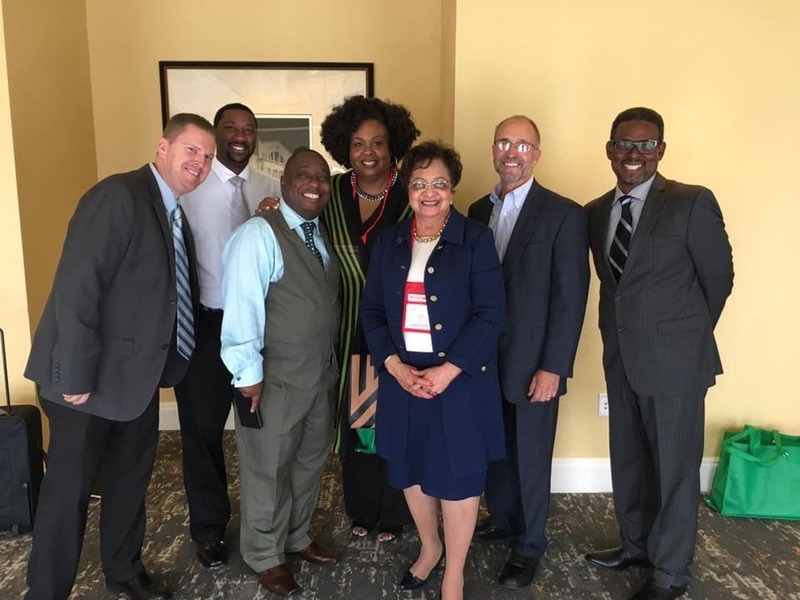 From left, DeSoto Senior Center Manager Nathan Busby; Recreation Specialist Roderick Turner; Recreation/Civic Center Supervisor Kevin Moore; Managing Director M. Renee Johnson; Mayor Curtistene McCowan; CAPRA Visitation Committee Chair Gregory Mack; and Parks Operations Coordinator Danny Johnson. DESOTO—The National Recreation and Park Association (NRPA) recently announced that the DeSoto Parks & Recreation Department has received accreditation by the Commission for Accreditation of Park and Recreation Agencies (CAPRA). With the announcement, DeSoto Parks & Recreation joins an elite group of 155 park and recreation agencies across the nation who has achieved accreditation. National accreditation through CAPRA signifies that the Department employs national best practices in all facets of the organization. It is an extensive, multi-year process which includes the completion of an application and detailed self-assessment report as well as a site assessment conducted by the agency and the Commission. Accreditation requires agencies to respond to 151 standards representing elements of effective and efficient park and recreation operations. The DeSoto Police Department has been accredited by the Commission for Accreditation of Law Enforcement Agencies (CALEA) since 1993 and recently underwent a re-accreditation. With the announcement of the Parks & Recreation Department accreditation, DeSoto is now one of only three local government agencies in the North Texas area to have two accredited departments. DeSoto Parks & Recreation provides year-round discovery, experiences and playful fun for residents and visitors. Twenty-one developed and undeveloped parks totaling 491 acres provide ample of space for picnics, a game of touch football, or just a relaxing stroll. Since 1998, the City of DeSoto has spent in excess of $17.2 million renovating and developing park sites including a linear trail system. The mission of the DeSoto Parks & Recreation Department is to enrich the quality of life in DeSoto and provide world-class customer services, premier parks and dynamic recreation experiences. Previous article2017 Nissan Rogue: A Rogue Sportscar?